I have added another chore to the chore chart, shopping buddy. Kade did this chore today. 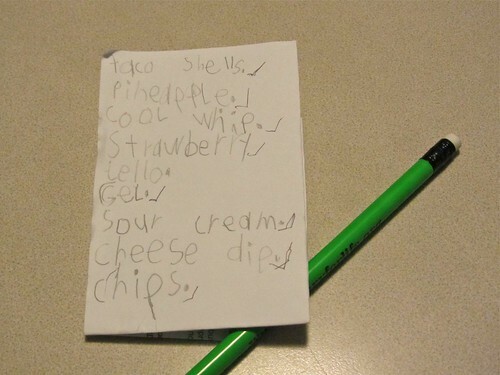 Before we left for the store, and while I was doing dishes, I had Kade write up our shopping list. He knows what letters make what sounds so I helped him sound out the words while he wrote. While doing this I started thinking how weird the English language really is. I am a phonetic speller, always have been. This means that I had to learn that everything is not spelled the way it sounds. (There are still words that throw me off.) Why can't it be that way? It would make things a lot easier. I had to point this out to Kade while he made the list. Some of my/our concerns are: Why does shells need to have two Ls or berry need two Rs when one would suffice? Why does cheese need three Es when two would make the long E sound? And why do some words have a silent E to make the long vowel sound and others have another "silent" letter right after it? I tell you, it's confusing.